I love my new house but the wind is something fierce! So I am in the process of cutting the wind and giving myself options for more interesting gardens. 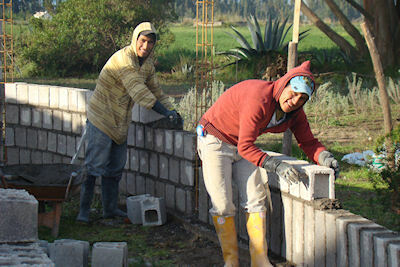 With this in mind I have hired Marcelo and Fernando to build these walls and to make them, I hope, aesthetic. 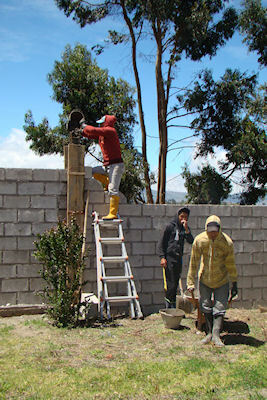 Never before have I been around anyone building concrete block walls so is I have had a lot to learn. Like you have to make footings and you need columns with metal inside. And when you come to curves, having a concrete saw and blade is just so helpful. Cause, curves are a whole lot more work. My wall is coming along beautifully. We have some higher walls near the rear and lowered it a little at the front because locally my house is know as Casa Bonita and already I have had lot a folks comment that they will not be able to see the house. No, they won't but I am hoping with the curves, white plaster, colourful plantings and a little lower height that it will do the job I need and still be a good contribution to beauty. I have been thrilled at how the wall is progressing. My fellows work very hard and are exceptionally precise. Even they seem to be pleased with what is happening. And as we turn the corner for the final leg we are adding in a bodega as we have no real place to store tools, seed, ladders, and similar items. This will be a space that both I and Isabel can share so we can continue to make the new Rose Haven nice. We also have to make nice thematic metal gates and continue until all 3 main sides are enclosed. Then inside we are going to remove much of the herbes malos, weeds to you, so I can have a colourful and hopefully a bit exotic garden because I really want some palms!